Being a deacon has been a rewarding experience, and I believe deacons will continue to become even more integral members of the Body of Christ. As I prepare for my ordination to the priesthood, I am aware that people want to connect with the Risen Christ, and they wonder how the Resurrection impacts their lives today. The accounts of the Resurrected Christ are much different than the accounts of God in the Old Testament. Both the New Testament and the Old Testament speak of the same God, yet our understanding of God and what he has revealed to us changes in the New Testament. After the Resurrection, Jesus forgives his disciples. Nobody is excommunicated from his group of followers — in fact, all are invited to be with him at meals and to proclaim the Gospel. The Risen Christ does not punish people for abandoning him or inflict pain on those who crucified him. As a priest, I hope I can encourage all people to accept the invitation to be with the Risen Christ — the God who wants all people to be with him in an atmosphere of peace. Thank you for your prayers, and know that I remember all of you in mine. Deacon Jim McCabe is a Redemptorist who will be ordained to the priesthood June 11 at St. Peter the Apostle Church in Philadelphia. 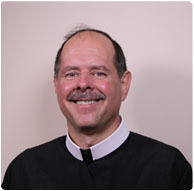 He has served his diaconate year at St. Martin of Tours Parish in Bethpage, NY.